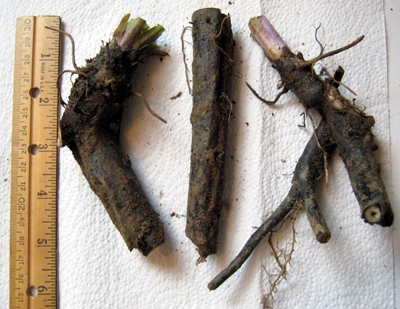 Russian Comfrey Root Bocking #4: Buy live roots for planting. Organic. 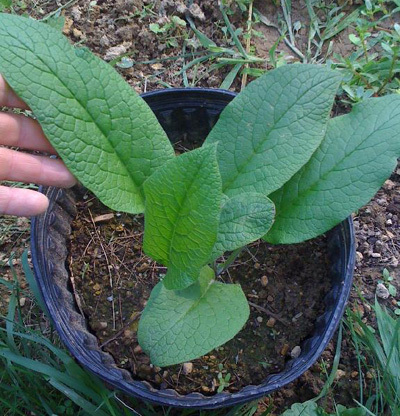 I sell Bocking #4 strain of Russian comfrey, Symphytum Peregrinum. It is high in protein (22%) and has a high yield, up to 100-120 tons an acre. It is a very good perennial fodder herb for animals. 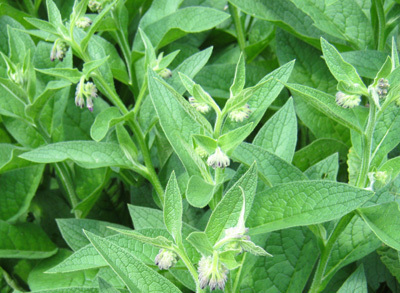 It is also known as Quaker comfrey, Russian Comfrey, American Comfrey, Healing Herb, Blackwort, Bruisewort, Wallwort, and Gum Plant. 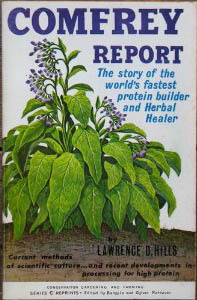 It is scientifically known as Symphytum asperum x officinale which is the same as Symphytum peregrinum which is the same as Symphytum x uplandicum. Russian Comfrey No. 4 has purple flowers. It is a natural hybrid (cross-breed) developed in the 1950s by Lawrence D. Hills, the founder of the Henry Doubleday Research Association. It is not GMO (Genetically Modified Organism). 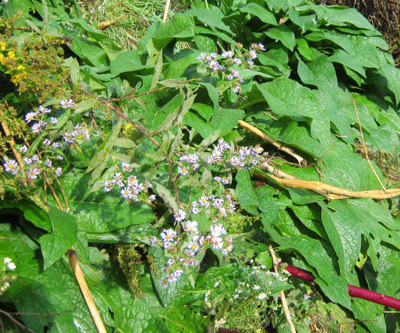 This photo is Russian comfrey growing on a hillside with other plants such as Asters and Pokeweed. Mixed with other plants it is good for erosion control. Russian Bocking #4 is more drought resistant than Russian Bocking #14 because #4 has deeper roots. Bocking #4 roots go down 8-10 feet. Bocking #14 roots go down 6-8 feet. However, both are very drought resistant. This photo is from Tony in Fairfax, Virginia. He grows his Russian Comfrey mixed in with his other garden crops. It is not invasive at all. The seeds are sterile (will not grow). Over the years a plant will slowly widen with new plants growing right next to the mother plant. But it will not send out invasive runners that take over a garden. If you want more plants, you can divide plants and replant them elsewhere. The photo to the left is the flowers buds before they open. Bocking No. 4 cultivar is popular as feed for animals such as goats, sheep, cattle, pigs, ducks, chickens, donkeys and horses. Harvest leaves many times throughout the year. 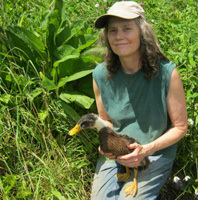 Animals love comfrey. 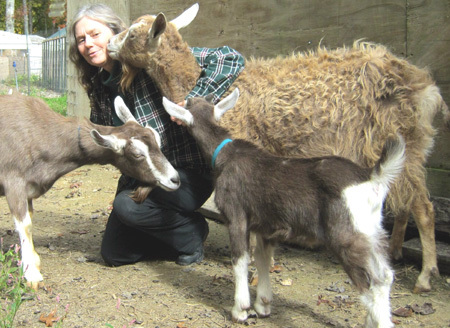 My goats eat all varieties with great enthusiasm. 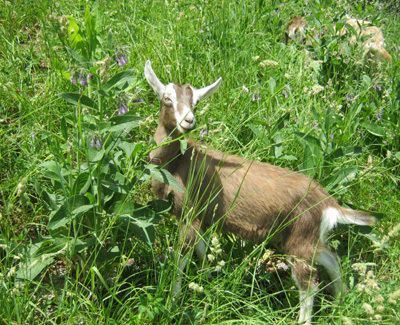 This is a photo of a Toggenburg doeling in my pasture with comfrey and other plants. I use rotational grazing so they do not eat down the comfrey too much and weaken it. For a comparison of Russian Comfrey Bocking #4 and #14 see the Bocking #14 page. "There are two commercial strains-- the Webster and the Stephenson. The Webster Strain: This is the most popular commercial strain, started by the late R. O. Webster to have been imported by his father from St. Petersburg, Russia, in 1900. Bocking No. 4- This is the dominant in the strain, about 50% to 60%. The flower color is Bishops Violet 34/3 when fully open. It has strong stems and small wings." "The leaves are broad and round tipped; their proportion is 5 to 10, but they have no incurling: therefore they appear far wider than a No. 1, for example. The edges are unserrated, and the veins are prominent, with bristles thickest on the underside so that the upper leaf surface appears smooth. At leafy stage these leaves are very large, recovering rapidly from cutting. The stems, as in all variations under trial, are solid." 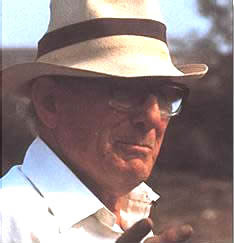 The photo to the left is of Lawrence Hills who created all of the Russian Comfrey Bocking variations #1 through #21. I sell hardy stock that is ready to grow. These are live plants. Ready for planting. 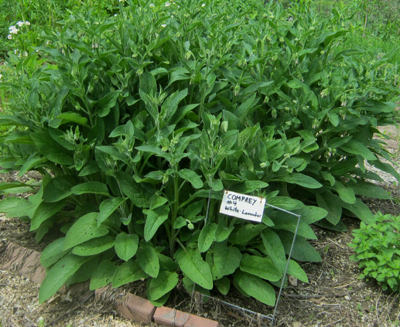 Comfrey can be planted any time the ground is not frozen. They do well planted spring, summer or fall. It can be planted in the winter in warm climates. It is very cold tolerant...the perennial roots are hardy to minus 40 degrees (-40)! The leaves can withstand temperatures as low as 15 degrees and still be healthy. 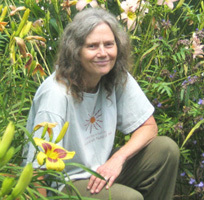 The plant can survive in temperatures as hot as 120 degrees. Good in USDA Zones 3-9. It starts growing early spring and continues growing into late fall. 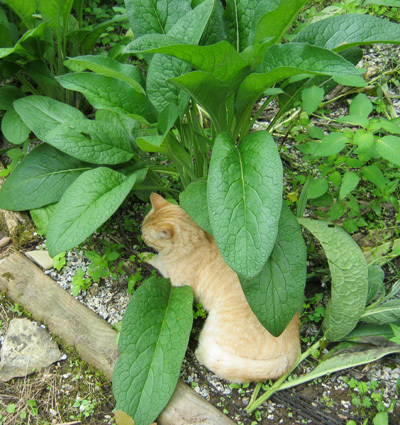 The photo with the cat shows the size of one plant. The leaves are large. It gets taller than that (about 3 feet without the flowerstalk). 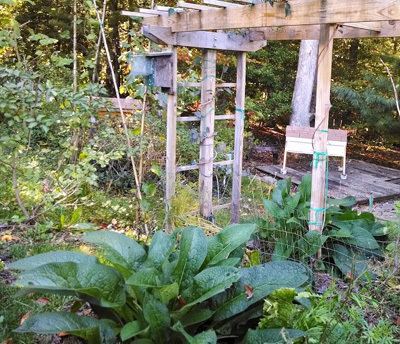 The photo of the comfrey #4 in the black pot is from Rick in New Bloomfield, Pennsylvania. The plant is from a root I sent after 17 days. Rick says "The plant is growing rapidly and the leaves look bright and healthy." This photo and the next one are from Misti. They are Russian Comfrey #4 coming up in the spring. 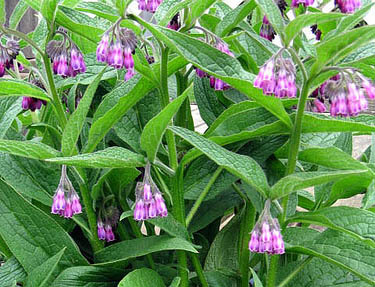 Send me your comfrey photos. I can add them to my farm site. This photo shows what your root will look like. They are sprouted with small green leaves. $19.00 for a root cutting of Russian Comfrey Bocking #4. Shipped Monday. Shipping is $7 no matter how many comfrey roots you order. 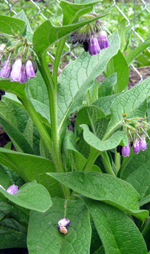 You can order other types of comfrey root too, all with just $7 shipping total. Your roots will be crown cuttings with leaves trimmed off or a root cutting with a bud that is ready to grow.